I will there on the 12th too. PNC i totally agree about Ekka needing a descent dodgem track. do you remeber the days when Lorimer Bros had there permenant track there it was located next to the ferrari 500 who also had a roof over the track. this was alot bigger then any of them these days . I think the track had to be removed due to the tunnel going underneath and now both the brothers have passed away since. Must complimnt on your rides every time I see them they are always well presented. Takes time PNC, but I am sure you will. Good on you Matty. I can't wait for the new AAF site; I'm sure it'll be something special. I don't think I'll make it up to Brisbane for Ekka but you never know... I'll be doing the next best thing, reading all the fantastic reviews and going green with envy. Depending if I take my camera or not (I Hope to be) will determine if I take photos. I would take video footage but my camera is real bad for videos. Because I could ride any ride and not get sick, thats 1 reason, there are many others, know what I know now etc. I never ever get sick and i never have. I go on any ride and never get sick. And i'm also the right height to get on any ride. Give it a few years Top Gunner - ride everything in excess while you can! I'm 28 and hardly ever feel sick on rides although the Scorpion does unpleasant things to my stomach sometimes... I'm always careful never to eat or drink too much before tackling the carnival or theme park and wait at least half an hour after eating before doing any major rides. That seems to work okay for me fortunately. I wonder if your vision has anything to do with you not feeling ill, do you get seasick, somethng to do with the balance of the brain, I think, related to the vision, who knows, but sounds feaisable. Yep i'll try everythin while i can. I want to try no limit(i'll try that at canberra cause they offered me a free ride while i was there with cattle and they were testin their rides. I chickened out. Now i regret it.) I also want to try insanity. I've seen this in mtion and boy, it goes fast from what i gathered! Well I dont have problems with the rides, none of them make me sick, even when ridden in excess and after alcohol and food. I think its because I am riding something atleast once a month so my body is constantly use to it. Still yet to find someone who can outride me. Young Trav who used to be on these boards and who I met up with one Melbourne show came pretty close. I'm jealous Matty! I could perhaps outride you in a day at the show or carnival but I certainly don't go on those things as often as you do, not even when I had my season pass to Wonderland did I go once a month. You're so lucky! Princess, you could be right about the vision thing. 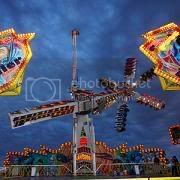 Just back on to ekka(sorry to spoil your fun ) Have any rides arrived at da showground yet or been set up? No Limit is going to EKKA this year, but sadly ThunderBolt isn't going this year I have obtained a full ride list and I will post it tomorrow.